I was registered to join the Four Lakes 100K Ultra Trail Race and I was ready and trained to finish this race within the cut-off time of 30 hours. I did finish this race two years ago with a time of 26+hours when the cut-off time was then 28 hours. Mentally and physically, I was prepared to finish this race as this was considered as one of my training races in preparation for the 2018 Madeira Island Ultra Trail (MIUT) Race in Madeira, Portugal to be held in April 28, 2018. In addition to finishing the BDM 102 Ultra in 15:20+hours three weeks earlier, the Four Lakes 100 Race would be a follow-up training race for me leading to the MIUT Race. In between these two races, I had my daily recovery runs and a Mountain Repeats workout in my favorite Mt Roosevelt’s Loop #3 in my Playground two weeks before race day. 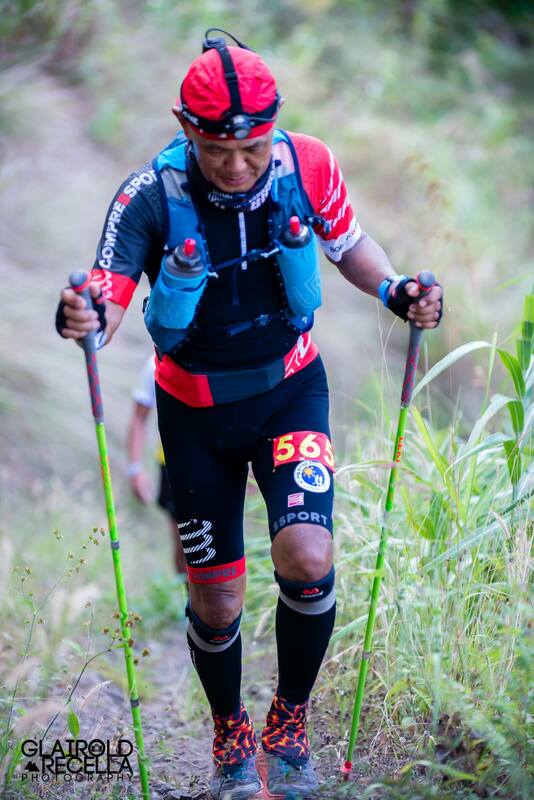 Halfway towards Kayapa, Nueva Vizcaya, I received an information from one of my nieces that my Father died from his sleep in the morning of Friday, few hours before the start of the race. As I travel to the venue of the race, I called my brother and sisters and made some suggestion about the schedule of Viewing and Funeral for our Father as most of our plan, in case of his untimely death, had been finalized long before while he was still alive. The plan was immediately implemented hours after our Dad’s death and I just kept peace and silence to myself and focused mentally to finish race where I had registered. The race promptly started at 3:00 AM of Saturday and I started the race at the back of the pack. Knowing that 100K is a very long race and that Four Lakes 100’s race route is new to myself and everybody, I thought of being conservative on the first half of the race with the intention/objective of arriving each Checkpoint/Aid Station within the prescribed cut-off time. 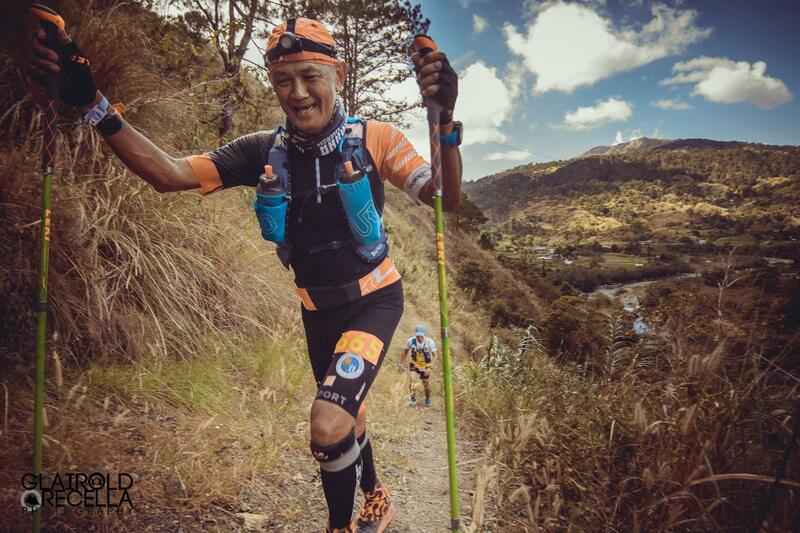 My smart strategy for the first half is to conserve my legs’ energy by using my Trekking Poles on the first ascent of the course with the hope that I could still run on the descents of the 2nd half of the course. I was happy to have reached the summit/peak of Mt Ugo earlier than the first time I joined this race. I would start to run on the descent from the peak of Mt Ugo and alternately, hike and jog until I reached the Domolpos Aid Station. I ate two pieces of local “Suman” and refilled my Hydration Bottles with water and electrolyte powdered mix which was enough to provide me the much energy to reach the first Checkpoint at Kayapa East Market. I took my time to eat some food and refill my bottles even if I still have 25 minutes of buffer time from the cut-off time of 8 hours. I was not in a hurry to reach the dreaded ascent at Amelong Labeng as I made up my mind not to stop or take a very long rest in one of the 3 waiting sheds along the said route. On my first finish in this race, I had a lot of rests and stops along this route that I had to engage in a very long conversation with some of the runners then, not knowing that they are participants in the shorter Old Spanish 50K Trail Run. For this year, I had to maintain my slow trek on this route using my trekking poles with some 5-10-second rests to catch up my breath. On the last waiting shed, I had to sit and ate some rice balls stashed in my Race Belt but I did not stay long as more runners were seen coming up to my direction. Finally, I reached the Elementary School where I had to refill my bottles and make my Electrolyte Mix drink. As the heat of the sun was too hot when I was in this area, I had to douse my head, neck, arms and upper body with the cold flowing water coming from the faucet and it was refreshing and invigorating. I had to leave the place immediately as most of the runners were approaching my position. It was a repeat of my first finish when going up to the Tower Antenna at Amelong Labeng with the intense heat coming from the sun. I had to persevere and trust my training at this point where I would “power hike” with the aid of my trekking poles until I reached the peak of the mountain where the Tower Antennas are located. I started to run and jog on my way down to the Highway but along the way, I would here some mysterious sounds behind me as if somebody was trying to pass me but I could not see anybody. As I ran faster on the descents, such sound would never leave and then suddenly, I hear somebody calling my name “Ben” as the wind blows behind my back. I could not believe experiencing this as I don’t believe in “ghosts” or paranormal activity throughout my life. I knew I was neither dehydrated nor “bonking” on my nutrition needs at this moment. As I continued my running, I remember those stories we shared each other with my brother about our Father on the early portions of the race. We were both laughing about these stories while were were running. (Note: My brother was one of the runners of the OST 50K Trail Run). I felt guilty that here I was in the mountains running a race while my Dad was being prepared for viewing. At this point, I started to think and decide to shorten my race and be with my Dad. Two kilometers before reaching the 2nd Checkpoint in Castillo, I called the RD and requested him that I am going to downgrade to the OST 50K Race because of the “paramdam” I’ve experienced on top of Amelong Labeng. The RD approved my request. I reached Castillo in 12:15 hours which is almost 2 hours ahead of the cut-off time in this Checkpoint for the Four Lakes 100 Trail Run. From Castillo, the route is all descending 4+kilometers to the finish line. I finished the OST 50K Trail Run in 13:08+hours without any pain in my legs and body. My condolence Gen. Narcise from me and my family. Congratulations for finishing OST. A really detailed and interesting report. So sorry to hear about your father.